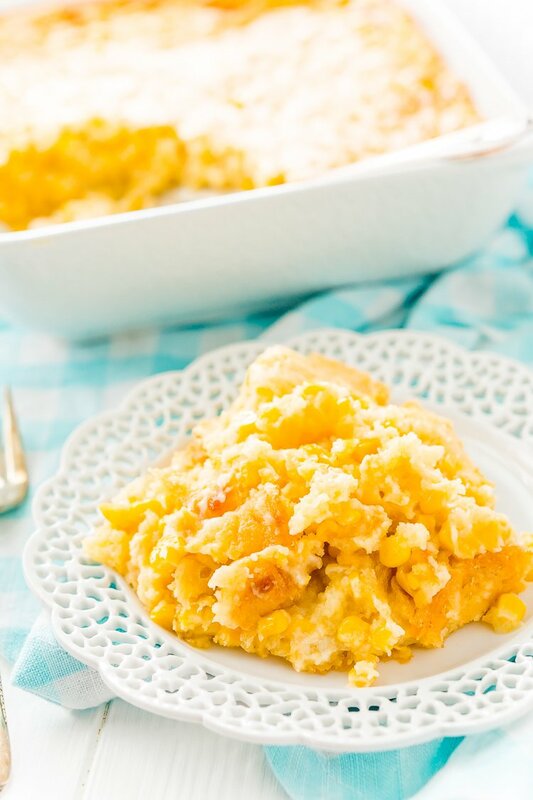 Cheesy Corn Casserole is an easy, no-effort side dish made with just 6 ingredients and ready for the oven in just 5 minutes! It’s an instant family favorite during the holidays! Looking for a quick and easy side dish that you can throw together in minutes flat? This creamy and crowd-pleasing Cheesy Corn Casserole will help make holiday prep a total breeze! When it comes to getting together for big family meals, everyone pitches in. This delicious dish is perfect to bring if you’re invited to someone’s house for Thanksgiving or Christmas dinner! Or maybe you’re hosting, and you need an extra recipe to round out the table. If you’re making the main course, you already have enough on your plate (get it?! ), and the sides should be simple and easy! JUST TAKE ME TO THE CORN CASSEROLE RECIPE ALREADY! 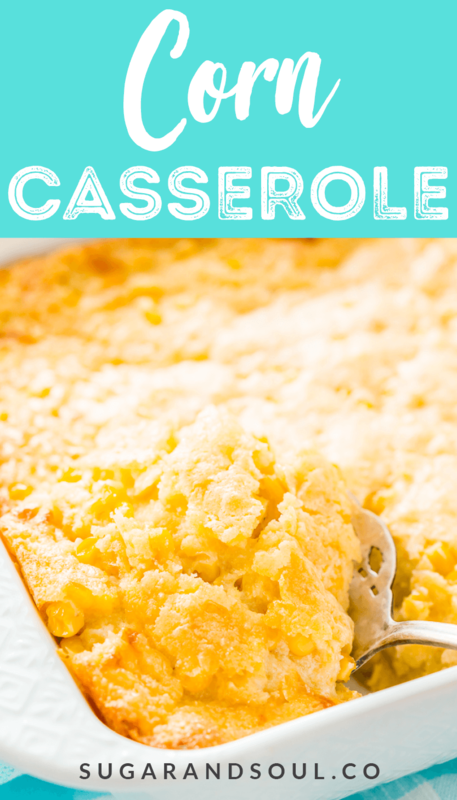 If you’d rather skip my (very helpful, I think) tips and tricks, essential cooking info, and similar recipe ideas – and get straight to this deliciously easy Best Ever CORN CASSEROLE Recipe – simply scroll to the bottom of the page where you can find the printable recipe card. To make Cheesy Corn Casserole Recipe, you only need 6 ingredients and about 5 minutes for prep time. 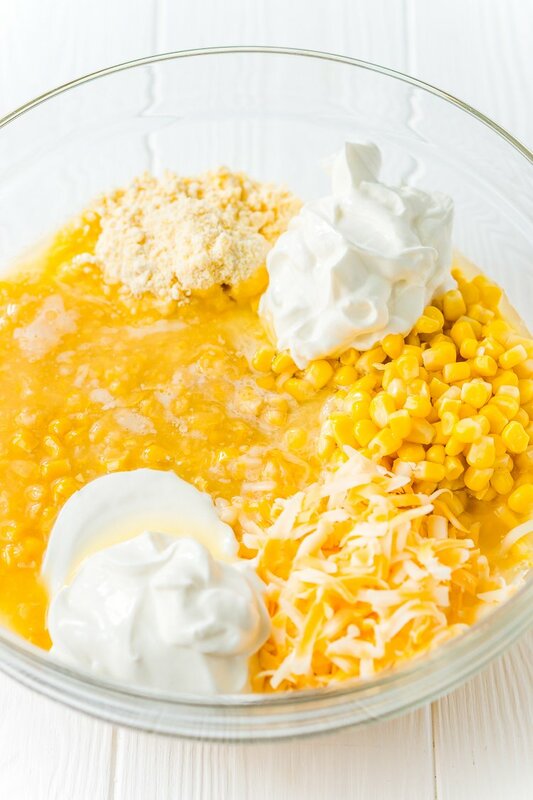 Combine cream-style sweet corn, whole kernel sweet corn, sour cream, melted butter, Colby Jack cheese, and the secret ingredient: Jiffy Corn Muffin Mix! Just throw everything together, bake for 45 to 50 minutes, and you’ll have a steaming dish of Cream Corn Casserole that’s ready to serve! First of all, don’t use anything smaller than an 8×8-inch baking dish or the casserole could overflow. A 9×9-inch dish also works just fine and you could also make this in a 10-inch pie dish. The corn mixture will rise up quite a bit from baking, but it will deflate after you pull it out of the oven. This is totally normal — you didn’t do anything wrong! Depending on the brand of canned corn you use, sizes may vary slightly, but anything between 14 and 16 ounces will work fine. Also, only use whole fat sour cream, not the low-fat stuff! 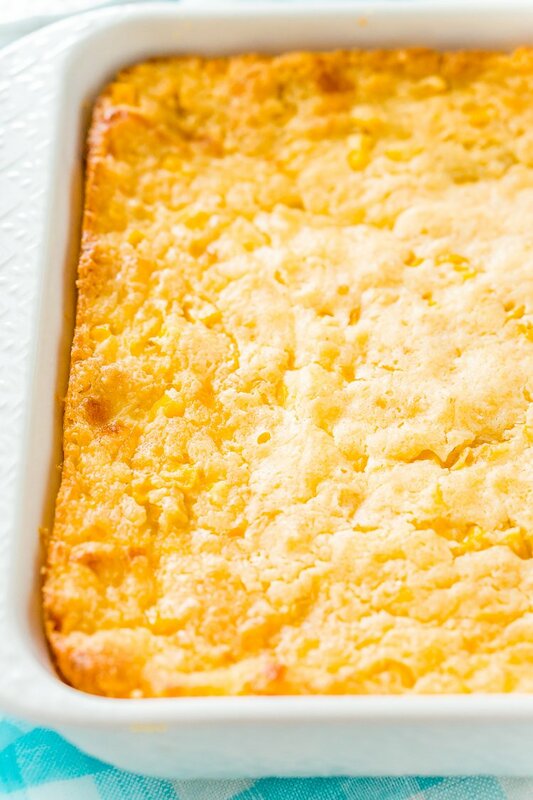 Corn casserole is soft and it may look undercooked, but it’s not. The cream style corn and cheese keep it slightly gooey, but that’s what makes it so good! 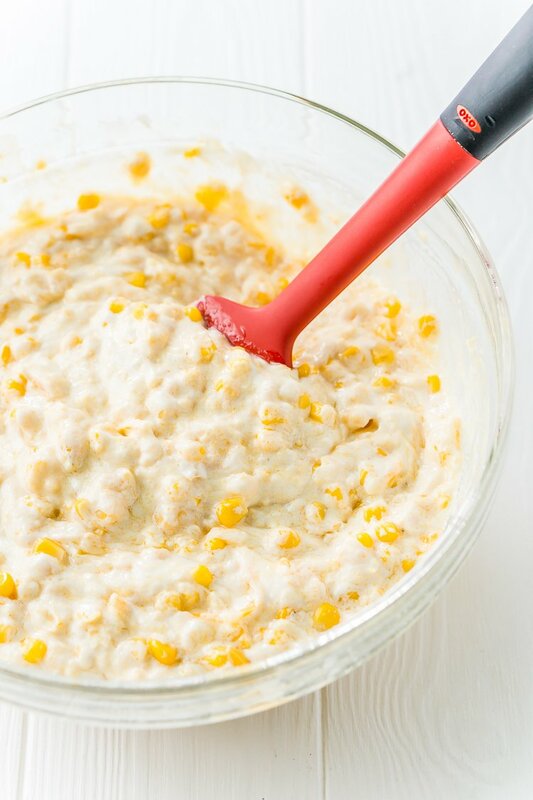 You’ll love making this simple, delicious Corn Casserole with Jiffy Mix all throughout the holiday season. No one needs to know how easy it is to make! There’s never any leftovers when it comes to this recipe, our family seriously gobbles it right up as soon as it hits the holiday dinner table and once you try it, you’ll know why! 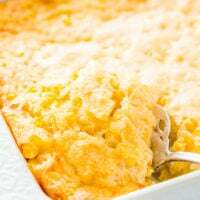 This Cheesy Corn Casserole recipe is so easy to make too, it’s my go-to dish when I don’t want to buy a million ingredients or spend a ton of time on a side dish. More Delicious Side Dish Recipes! 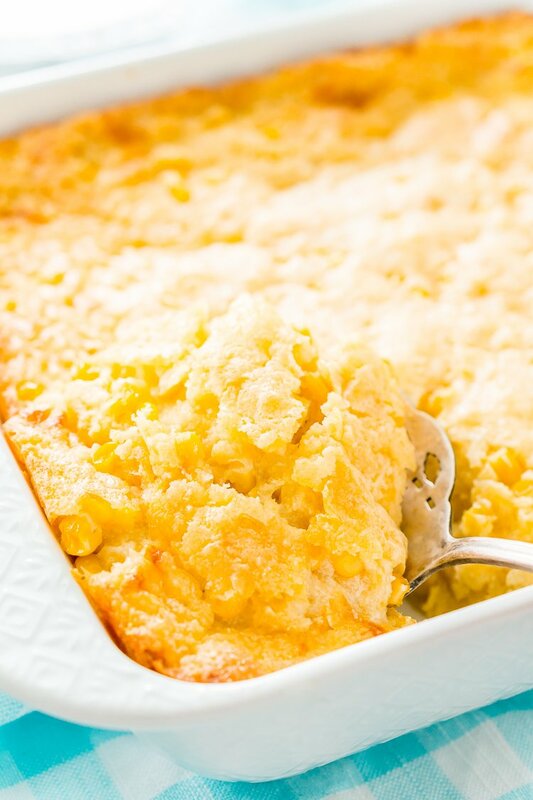 Cheesy Corn Casserole is an easy, no-effort side dish made with just 6 ingredients and ready for the oven in just 5 minutes! It's an instant family favorite during the holidays! Preheat oven to 350 degrees F and grease an 8x8-inch baking dish with non-stick cooking spray and set aside. In a large bowl, mix together the ingredients until fully combined. Transfer to the prepared baking dish. Bake for 45 to 50 minutes and serve warm. A 9x9-inch dish may also be used. The mixture will rise up quite a bit but will deflate after taking it out of the oven, this is normal. Make sure that you don't use anything smaller than an 8x8-inch baking dish or it could overflow. Only use whole-fat sour cream. Depending on the brand of canned corn you use, sizes may vary slightly, anything between 14 and 16 ounces will work fine. 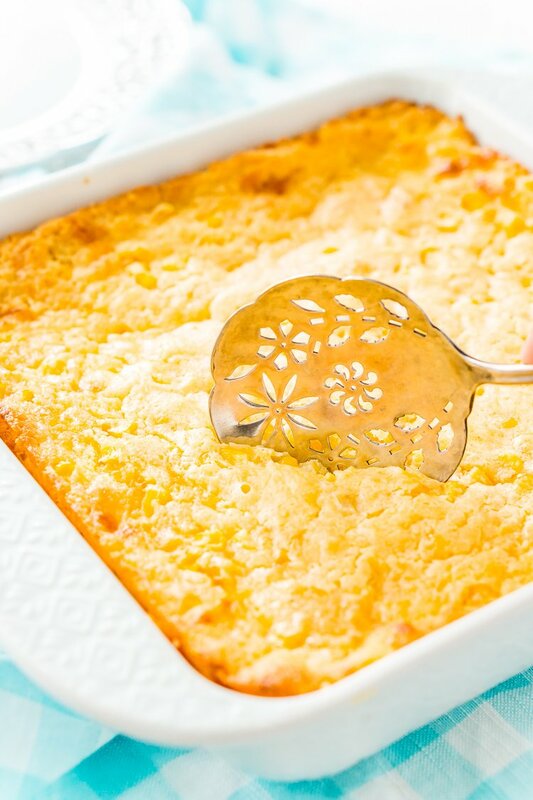 Corn casserole is soft and it may look undercooked, but it's not, the cream style corn and cheese keep it slightly gooey! Such a comfort food side for the holidays! I’m sure this will make an appearance on many holiday menus! This looks fabulous! Would love to give it a try!